We’ve seen this movie before. Blockbuster Amazon, starring Jeff Bezos and his then yet to be profitable company, perhaps rescued from insolvency by the credit market. This epic saga co-stars convertible bonds, which won an academy award for financial solvency. 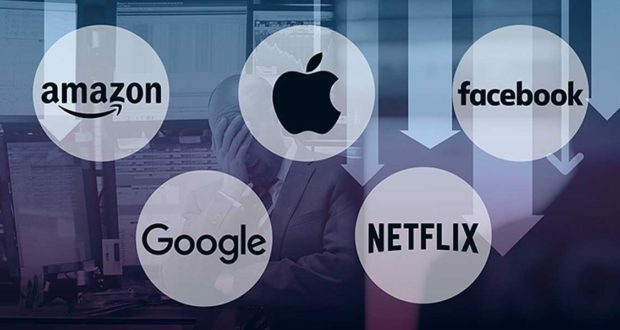 Despite Amazon alone losing $53 billion in market value of late, FAANG’s largest loser, it is the bond market that has big tech tittering these days. What was the knight in shining armor for Amazon in the dot-com era, may be the Achilles heel of modern tech start-ups. Nearly half of outstanding tech bonds are “out of the money,” with the recent precipitous drop in equity prices making these bonds less likely to be converted. A convertible instrument, albeit a bond, note or debenture, is a type of bond that the holder can convert into a specified number of shares of common stock in the issuing company or cash of equal value. It is a hybrid security with debt and equity-like features. As such, convertible bonds are most often issued by companies with a low credit rating and high growth potential. To compensate for having additional value through the option to convert the bond to stock, a convertible bond typically has a coupon rate lower than that of similar, non-convertible debt. This, in theory, could be a win-win for both sides of the transaction. The company wins by offering debt at a lower coupon rate than it normally could without the equity conversion kicker. The investor receives the potential upside of conversion into equity while protecting downside with cash flow from the coupon payments and the return of principal upon maturity. Other major tech names that have relied on convertible bonds include, Uber, Twitter, and Tesla. Nearly half of the $65 billion in tech issued convertible bonds are “out of the money,” meaning their current stock price is below the set conversion price stated in the bond agreement. 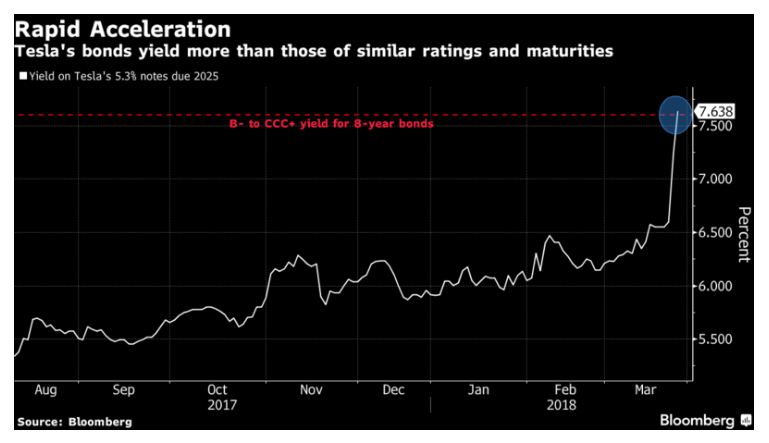 If these bonds hit maturity “out of the money,” the issuers will be forced to pay the principal due, or attempt to restructure the debt if possible. This usually comes at a bad time for the company, as it can be cash-strapped and may have difficulty making the principal repayment on the bonds. One of the big questions surrounding the credit markets today is the same convertible bond dilemma, with the difference being that electric car maker Tesla is the featured company. Like Amazon at the time of issuing convertible bonds, Tesla has never shown an annual profit in the 15 years since it was founded, and has about $1.2 billion of debt coming due by 2019. One of Tesla’s 2014 issues carries a conversion price of $359.87. The likelihood of conversion has tumbled in the past two weeks, as the stock lost 21 percent to close at $257.78 on March 28th. From the death of Wei Huang, 38, who died when his Tesla collided with a highway barrier on southbound Highway 101 in California, to the production woes of the Model 3, Tesla finds itself in a very precarious situation.